1. Place a large fry pan onto medium heat, add the ghee, red onion, garlic, ginger and spices, saute for a few minutes on medium to low heat until the onion is soft and the spices are fragrant. 2. Add the grated carrot and saute until the carrot is soft, about 3-5 minutes. If the mixture seems a little dry, add a tablespoon or two of hot water. 3. 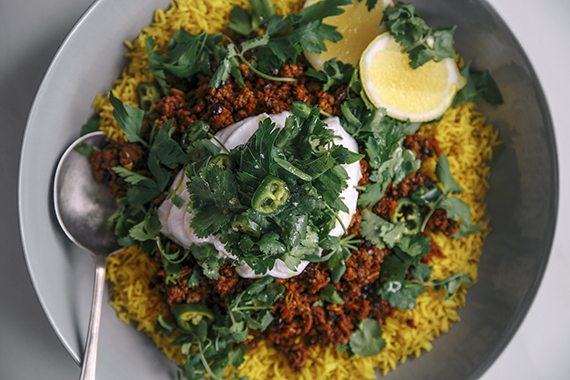 Add the lamb mince and sautee on medium heat until the lamb is cooked through. 4. Add the parsley and coriander stalks, along with the tamari, currants, lemon zest and sea salt. Simmer on low heat for 10-15 minutes. 1. In a non stick pan, add the ghee, turmeric, black pepper and salt, and cook for 30-60 seconds, until the turmeric is fragrant. 2. Add the pre cooked rice and saute on low to medium heat until the rice is golden in colour form the turmeric and warmed through. 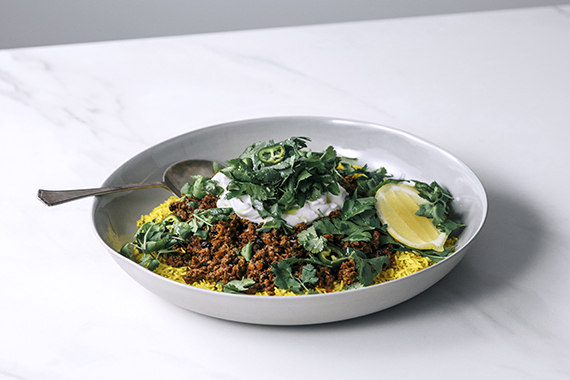 In a large serving bowl, or in individual serving bowls add the turmeric rice, top with the spiced lamb, a dollop of yoghurt, fresh coriander and parsley leaves, and some lemon wedges on the side. Enjoy!